Western Sydney coach Markus Babbel reckons motivation won’t be an issue for his side’s last two A-League games, with players who are looking to leave the club keen to impress potential suitors. The Wanderers last week lost any chance of making the finals, but on Saturday had the motivation of a Sydney derby and the chance to end their lean streak against the Sky Blues to drive them. 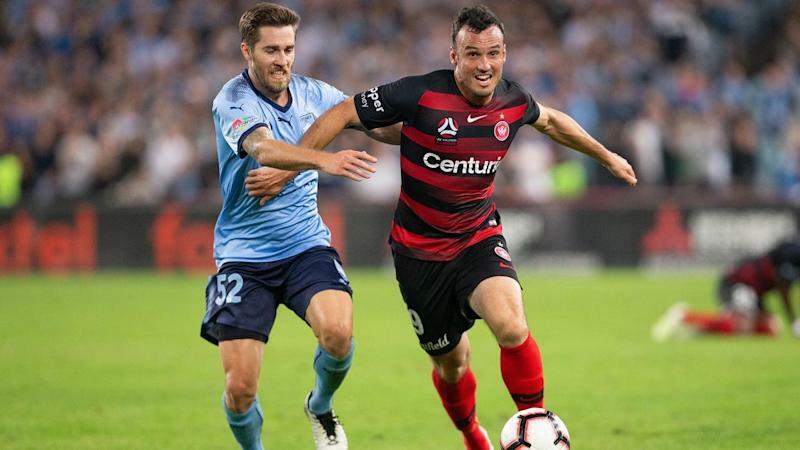 The Wanderers came from behind to force a 1-1 draw at ANZ Stadium, after having won only one of their last 17 league and cup games against their cross-town rivals. Wanderers will almost certainly remain in eighth spot whatever happens in their last two games away to Central Coast and at home to Melbourne Victory. They will miss the finals for a second straight campaign after finishing seventh last season, but Babbel was adamant his charges won’t struggle for motivation over the last two weeks. ‘To get six points, this is a great challenge there for the players,” he said. “‘We have to do something because we’re not happy with the last two years and we will do some changes. “Even if they have to leave the club it’s a great chance to show, ‘hey, if you take me you’ll get a good player’, so this is up to the players. Some observers on Saturday were surprised Babbel replaced his German compatriot and playmaker Alexander Baumjohann with 20 minutes to go. Baumjohann’s deflected free kick delivered the equaliser and his accurate set-piece deliveries created a number of other opportunities. Babbel said he brought on Mark Bridge -who chalked up his 249th A-League appearance – to add some energy, but the veteran striker didn’t have a lot of impact. “I’m happy that I have this problem because we have competition in the team now,” Babbel said. He was pleased with the effort of another substitute, midfielder Giancarlo Gallifuoco, who came on at halftime for the combative Keanu Baccus, who was booked early in the game. “It was not his game today, he was not 100 per cent in the game, the passing wasn’t good,'” Babbel said of Baccus. “He’s a local guy and maybe he was a bit over-motivated, but he’s 20 years old, he will learn from this.